I share your frustrations about the ongoing and challenging situation resulting in school closures. As a result of the signed K-12 education budget, I am pleased to announce the reopening of all PVSchools, effective tomorrow, Friday, May 4th. All regular district services will resume, including before and after school childcare. As we prepare to reopen our schools tomorrow, I would like to provide important updates regarding pressing questions that many of you have shared. Instructional time required by law will be met within the existing school calendar. Additional school days will not be added for students. The last day of school for students will be Thursday, May 24, 2018. AP testing, final exams, and graduation ceremonies will all continue as scheduled. School closures will not impact students’ ability to earn credits for dual enrollment, AP or IB courses. Teachers will ensure essential standards are met and students are prepared for next year. As always, student safety and learning are our top priorities. We are excited to get back to the mission of serving our students and families. On behalf of PVSchools, I want to thank our families and community members for your support and patience during this unprecedented and challenging time. James P. Lee, Ed. D.
Earlier today, PVSchools communicated with parents and staff that our schools would reopen tomorrow, Thursday, May 3rd. We have since learned that there has been a lack of progress at the Legislature, causing teachers to change course and report absences tomorrow. It is with incredible disappointment that I need to inform you that PVSchools will NOT be open tomorrow, Thursday, May 3rd as we originally planned to do. Just this afternoon, we are experiencing significant increases in reported absences for tomorrow. Without adequate staffing levels, we cannot ensure a safe and secure learning environment. Again, our top priority is the safety of our students, and we appreciate your understanding during this difficult time. ​Please continue to check our website at www.pvschools.net/walkouts.net each day for the most current information on when our schools will reopen. I am pleased to announce the Arizona Legislature is in the final stages of considering the Governor’s recent budget proposal. As a result, we anticipate sufficient staffing levels to reopen our schools and ensure safe school operations on Thursday, May 3rd. All regular district services will resume at that time, including before and after school childcare. As we prepare to reopen our schools tomorrow, I would like to provide some important updates regarding some pressing questions that many of you have shared. We have sufficient instructional minutes required by state law. Hence, students will not need to make up days missed due to the school closure. School closure will not impact students’ ability to earn credits for dual enrollment or AP courses. Material missed over the last few days will be reviewed to ensure essential standards are met and students are prepared for next year. As always, student safety and learning is our number one priority. We are excited to get back to the mission of serving our students and families. What should I do about my May payment(s) for Community Education Preschool and Mascot Club? For May, 2018, all Late fees and Change of Option fees will be waived, and your payment(s) will be due when school resumes. Why are some school districts open already, but NOT PVSchools? Every school district is basing decisions to reopen upon the number of staff absences reported. This is different for every school district. Some districts which are now back in session are much smaller than Paradise Valley Unified School District. The situation is fluid and we are continuing to evaluate staff attendance daily, so we can hopefully resume school operations and return students to their learning environments. What is the walkout timeline? We are evaluating staffing levels daily. Unfortunately, we will not reopen until we are able to provide a safe and secure learning environment for students and staff. Once the leadership of the walkout announces its end, we will send an email to your SchoolMessenger account that our schools will reopen. We will share the announcement on our district and school websites, social media, via a push notification on our district mobile app, as well as with the news media. When will our schools reopen? We are evaluating staff attendance daily and, unfortunately, will not reopen until we are able to provide a safe and secure learning environment for students and staff. Will we need to add more days to the school year? Our administrative team is exploring every possible solution. Our goal is to meet the required number of instructional hours required by Arizona law while minimizing the disruptions to our student calendar. Until we know how long this walkout lasts, we won’t know exactly what changes will need to be made. I heard that the Governor made a budget deal last Friday. Why aren’t we back in school? Last Friday, we heard the same news reports, but the alleged budget deal was made behind closed doors, and the Legislature just reconvened today to continue deliberations about the budget. Media outlets are reporting that the budget legislation will be made available to the public sometime this week. What happens when the walkout is over? What can families expect? ​​​​​​​Our expectation is that when the walkout is over, school operations will resume. When this occurs, we will quickly notify all of our families via phone, email and SMS text message for families that have previously opted in. If families don’t receive the message in time to be able to have their child(ren) return to school the next day, your child(ren) will receive an excused absence. Families will be still be required to report their child(ren) absent. ​​​The #RedForEd movement is a grassroots education reform movement in Arizona. 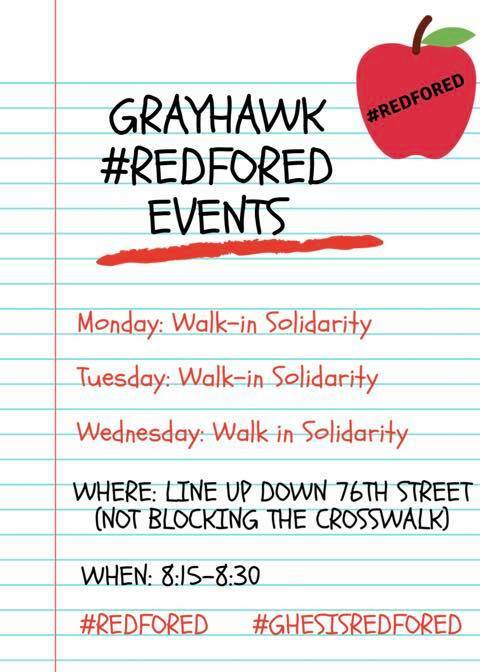 The #RedForEl,d walkout is not a district or school initiative; rather it’s a statewide led teacher initiative. AZCentral has published an article explaining the demands in detail. What is the impact of the teacher walkouts on my students IEP? ​There's a disclosure in IEP's that applies for school closures, so extra minutes are already built into the IEPs. When is the walkout going to be over? ​The situation is very fluid. We are monitoring staffing levels daily, as well as what’s happening at the AZ Legislature. We understand the hardship this places on many families and are doing everything we can to ensure delivery of timely communications. While we cannot provide you with an exact time frame regarding how much time you’ll be given before school resumes, (i.e. 24 or 48 hours notice, etc. ), I can tell you the plan is to give families as much advance notice as possible. I wish I had better news to share, but I am writing to let you know that ALL PVSchools will remain closed tomorrow, Wednesday, May 2, 2018. Today, approximately 75 percent of our certified staff have reported absent, and we are seeing a similar reporting pattern for tomorrow (Wednesday). With this information, we are unable to provide a safe and secure learning environment. We are hopeful that all parties can come together and bring resolution to this state-wide walk out. We plan to update you daily with information as we learn more. Additional questions and answers can be found on our FAQ, which is frequently updated. We thank you for your continued patience. We understand the challenges this poses for families and we look forward to welcoming our students back to school soon. I am writing to let you know that ALL PVSchools will remain closed tomorrow, Tuesday, May 1st, 2018. Commencement ceremonies at ALL high schools will remain as scheduled. High school Advanced Placement testing begins the week of May 7th and will continue as planned. We are looking at all of our options in an effort to honor and maintain our current school calendar. Additional questions and answers can be found on our FAQ, which is located on our website. We plan to update you daily with more information as we learn more. We thank you for your continued patience during these statewide actions and look forward to school reopening soon. It was our hope that we would be able to resume school operations on Monday, however, based on the data we’ve received today, we still do not have adequate staff to do so. Our first concern is always for the safety of all students and staff. Without adequate staffing levels, we cannot ensure campus security. Given this, all PVSchools will remain closed on Monday, April 30. We will continue to provide further updates next week regarding the possibility of school reopening. For questions above and beyond what’s included in our FAQ and District communications, re: the teacher walk out, please email: 2018-walkouts@pvschools.net. I would like to take a moment to clarify the update from Dr. Lee's letter that went out to our Paradise Valley families. As stated in his letter, all schools will be closed to students on Thursday, April 26, 2018 and will NOT reopen to students until further notice. I anticipate schools being closed to students on Friday, April 27, 2018 as well. Please continue to monitor your emails and/or PVUSD district website to ensure you have the latest information. It was our hope that we might be able to reopen schools this week. However, based upon the latest information received, we do not feel we will have adequate staffing and campus security necessary to safely conduct school operations. Therefore, ALL PVSchools will remain closed for the duration of the statewide walkout. We will notify families immediately when the walkout has concluded, allowing us to reopen schools. For the latest information, please check our district website www.pvschools.net/walkouts and on social media (www.Facebook.com/PVSchools and on Twitter @PVSchools). Also, as a reminder, please be sure your up to date contact information is on file with your school so you can be assured of receiving all district/school communications. Thank you for your continued patience as we traverse these statewide teacher walkouts. Per the correspondence you received from Superintendent Dr. Lee on Friday, April 20, a statewide teacher walkout is planned to begin on Thursday, April 26. Due to the anticipated high numbers of staff who will be walking out and the diverse needs of our students, schools will be closed on Thursday, April 26. We will not have adequate staffing and campus security to safely continue school operations and believe the decision to close schools is in the best interest of our students and staff. At this time, no information has been given as to the length of the walkout; however, we will continue to keep families and staff apprised regarding the status. Families will be notified via our SchoolMessenger emergency notifications system, which includes robo calls and/or email (if provided to the school). Information will also be shared on the district website www.pvschools.net/walkouts and on social media (www.Facebook.com/PVSchools and Twitter @PVSchools). Please be sure your up to date contact information is on file with the school so you can be assured of receiving all district/school communications. Food services will be provided. Breakfast Hours: 7:30 a.m. to 9 a.m. and Lunch Hours: 11:30 a.m. to 1 p.m. Please note that in order to meet federal food service guidelines, food must be consumed in the cafeteria. Only the meal designated for each serving time will be available. We’d like our PVSchool families to know that the sites below are open to those 18 years of age or under who are in need of breakfast and lunch services. Individuals may receive food services at the school site most convenient to them. Aire Libre Elementary, Arrowhead Elementary, Cactus View Elementary, Campo Bello Elementary, Desert Cove Elementary, Eagle Ridge Elementary, Echo Mountain Primary, Hidden Hills Elementary, Indian Bend Elementary, Larkspur Elementary, Palomino Primary, Sunset Canyon Elementary, Whispering Wind Academy, Greenway Middle, Vista Verde Middle, North Canyon High. Please Note: No other facilities at the school campuses noted above will be available during serving times. All preschool and infant/toddler childcare programs are cancelled. Cancelled programs include: Gifted Preschool, Lil’ Pioneers Infant/Toddler Development Center, Little Scholars Pre-Kindergarten, Little Scholars Spanish Immersion Pre-Kindergarten, Mini Scholars Preschool, Montessori Preschool, Title I Preschool, and SUN Kids Preschool. All before- and after-school care/programs are cancelled. Cancelled programs include: All Mascot programs and enrichment programs. Athletic programs and performing arts schedules will be determined by each school site. Some K-12 school field trips will continue as planned. Principals will provide specific information to their communities. Parents aren’t required to phone in their child(ren) absent while schools are closed. Based upon state laws and current policies, any day that school is closed may need to be made up. We will let you know as soon as we are able to regarding our obligation about possible make up days. Graduation dates and times currently remain as scheduled. Should anything change, we will provide as much advance notice as possible. Below are some community child care options you may want to consider for your child(ren) while school is closed. A full list of possible child care options is available on the District website: Please visit: www.pvschools.net/walkoutsPlease note that these resources haven’t been vetted by the district. Thank you for your continued support and patience as we traverse these statewide actions. Last night, we learned that there is a statewide teacher walkout planned for Thursday, April 26th. Yesterday, you received an email from me stating that we would make every effort to keep schools open. Due to the anticipated high numbers of staff who will be walking out and the diverse needs of our students, schools will be closed on Thursday, April 26th. I have said all along that we will not put students and staff in an unsafe situation, and I believe the decision to close school is in the best interest of our students and staff. We will not have adequate staffing and campus security to safely continue school operations; however, we intend to provide breakfast and lunch to students who need this service. While no information has been given as to the length of the walkout, if school is closed for more than one day, you can expect to receive daily communications from the district. Families will be notified via our SchoolMessenger emergency notifications system, which includes robo calls and/or email (if provided to the school) and SMS text message (if families have opted in) with information about school closures. This information will also be shared on the district website (www.pvschools.net) and on social media (www.Facebook.com/PVSchools and Twitter @PVSchools). Principals will communicate any site specific information to the community as needed. Please don’t hesitate to contact your principal directly with any additional questions you may have. Below is an FAQ we’ve prepared with some immediate questions you may have. 1). Do parents have to contact their school to report an absence? No. Parents will not need to contact schools to report an absence. 2). Does the closure also affect preschool and infant/toddler childcare programs? Yes. All preschool and infant/toddler childcare programs will be cancelled. Cancelled programs include: Gifted Preschool, Lil’ Pioneers Infant/Toddler Development Center, Little Scholars Pre-Kindergarten, Little Scholars Spanish Immersion Pre-Kindergarten, Mini Scholars Preschool, Montessori Preschool, Title I Preschool, and SUN Kids Preschool. 3). Does the closure affect before and after-school care/programs? Yes. All before- and after-school care/programs are cancelled. Cancelled programs include: Mascot programs and enrichment programs. 4). How will parents be credited for any cancelled Community Education fee-based program? Cancelled programs include: CE Preschools, CE Mascot Club, CE Enrichment classes. Your account will be credited the pro-rated amount and you will be able to apply this amount to any available CE Classes and camps for the Summer 2018 and for School Year 2018-19. 5). Will the district be able to provide meals? Yes. We intend to provide breakfast and lunch at all school sites for enrolled students who need services. More detailed information will be communicated directly from your school. 6). Will athletic programs including sports practices and games be affected? Athletic programs status will be determined by site and the program coach. 7). If a school is closed, would the school year be extended? 8). Would school closures affect graduation dates? 9). Will the prom still be held as scheduled? Yes. The proms will go on as scheduled. Should anything change, we will provide as much advance notice as possible. 10.) Are scheduled school field trips also cancelled? Some K-6 school field trips will continue as planned. Principals will provide specific information to their communities. 11.) What is the impact on the school closure to my employee group? The district will be sending out a separate communication to all employees regarding the impact of the school closure to our various employee groups. ​Below is an attachment which includes various online and video educational resources that may be useful to our families. Many of these resources will require students having access to electronic devices. Please note that we have not vetted all of the resources on these links. We appreciate your continued support of our schools while these statewide actions are under way. We will continue to keep you updated as more information becomes available. Grayhawk is located in Legislative District 23, but many of our families open-enroll. You can find information for several Legislative Districts on the UPC website, and there is also information on how to find your district if you are unsure. Public Access Channel "State Government" can be found on Cox 123. ​It shows live coverage of committee meetings and Senate / House sessions. Or choose which room to watch from all available live feeds online. Sonoran Sky PTO has compiled a list of childcare options in the Scottsdale area. If you would like to show support for our teachers and staff you can wear RED on Monday, Tuesday and Wednesday (April 23, 24, 25) and walk-in to the school together. Meet up at 8:15 at the SW corner of 76th and Grayhawk Dr.
Due to the anticipated high numbers of staff who will be walking out and the diverse needs of our students, the Paradise Valley Unified School District will be closed on Thursday, April 26th. While no information has been given as to the length of the walkout, if school is closed for more than one day, parents can expect to receive daily communications from the district with updates. ​All official district communications, including an FAQ will be shared at www.pvschools.net/walkouts. Information will also be shared on our social media accounts (www.Facebook.com/PVSchools and https://twitter.com/pvschools). We'd like to thank the media for working with us to share updates and information with our community. For more than 100 years, Paradise Valley Unified School District (PVSchools) has consistently represented the best in Pre-K-12 education. PVSchools serves more than 31,000 elementary, middle and high school students in 45 schools located in northeast Phoenix and Scottsdale. The district extends from 7th Avenue to Pima Road, and Northern Avenue to Jomax Road. Whereas we are confident our community, including parents, families, caregivers, business leaders, support professionals, teachers’ families, school District administrators, neighbors, and friends, will support meaningful pay raises for public school employees and increased education funding to educate our children and secure the future of Arizona.